I am inspired by this beautiful Mark Twain quote, that I just heard Wayne Dyer use, to take a look at forgiveness. Recently, I chose to forgive someone that had been the object of a lot of my anger for a long time. I foolishly convinced myself that my “grudge” was justified and not affecting me in any way. In reality, the thought or mention of the person sent a cascade of negative physical, mental, and emotional sensations rippling through me. I would shut down automatically, a brick wall would immediately rise up around me, and it would take a while for me to snap out of it and come back to normal. But then… a yoga teacher encouraged me to consider what I was holding onto in life. At first, I could honestly think of nothing. It, literally, took days of considering that question to see how my grudge was still going strong. Over time (and lots and lots of yoga), I realized that at the root of my grudge wasn’t anger, it was jealousy of her and insecurity within myself. Isn’t that really all that’s behind anger anyway? So, I began to let it go. I set the intention of letting it go in every yoga class and spent time meditating on letting go each chance I got. All of the years of watching Oprah streamed back to me…all of the experts, all of the advice, all of the wisdom. I even wrote an email telling the person that I let it go. Forgiveness works like a boomerang. When you give it out, it ends up sending back peace of mind, healing, and comfort. What do you really prove by staying angry? Does it prove you were right and they were wrong? No! 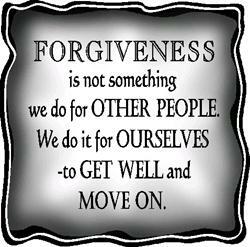 Maybe you think that forgiveness is like telling someone what they did was ok? No! Forgiveness is an act of choosing to live in the present moment and leaving the past where it belongs…far, far away! The past is your psychological enemy when it ‘teaches’ you that old hurts, wounds, humiliations, failures, and obstacles are relevant to the present…you cannot will your past to go away. Everyone drags around the burden of memory…Memories, for good and ill, are woven into your personal self…The more your awareness expands, the lighter the burden of the past. You find spontaneously that your attention is focused on the present, from which all creative possibilities emerge. Maybe Wayne Dyer is right, could it be that this person was sent into my life to teach me how to forgive and let go? Holding on to anger continually replays and repeats the hurt. The person doesn’t even have to do it anymore, you are doing it to yourself! I saved myself a lifetime of bitterness and hurt by opening my heart enough to let my anger, insecurity, and jealousy go. Now that I have practiced forgiveness once, perhaps I am prepared for a larger act that may be asked of me someday. Who knows? This is how the universe works. If you haven’t heard Jason Mraz’s new album, “Love is a four letter word”, you’re missing something really special. I love every song, very uplifting and positive with great messages. I can’t help but think that he must be practicing yoga! I walked into Flight School with Raghunath at Living Yoga yesterday with two feet solidly on the ground and within, literally, minutes I was upside down in an assisted Adho Mukha Vrksasana (handstand) and learning some arm balance transitions that made me feel like I was breakdancing. Raghunath is professor of flight, and Flight School is his famously popular anti gravity workshop for bona fide asana geeks. Advanced asanas are dissected, while experiments with variations and transitions are taught. You will catalyze your own dynamic signature practice, melt your fear, push your edge and realize your potential, no matter what level you are at. Take your practice to its highest. The workshop will be interlaced with chanting and stories from classic Indian texts; rooted in down to earth spirituality, and instructions for living a contemporary yogic lifestyle. Fasten your seat belt, Flight School is in session. My longest handstand to date does not even last one breath, but the workshop description welcomed all levels of practice so I eagerly signed up. I have been focusing on my handstand practice at home over the last few months, so it was perfect timing- as so many things in my life end up being. The workshop was all that was promised and more. I have NEVER done so much upper body asana “work” in my life. He started by announcing that the only way you will learn to practice handstand without the wall is to practice handstand without the wall…duh! So, no walls. Just great demonstrations and assists coupled with incredibly skilled sequencing and teaching. He taught several different arm balance transitions (no sage left behind…Vasisthasana, Astavakrasana, Koundinyasana, Visvamitrasana, etc.) and broke them down for all the levels in the room. We entered handstand from every direction possible, played with different leg variations, and somehow got ourselves to Chaturanga and a vinyasa each time. We ended with Sirsasana (headstand) II, III, IV (I didn’t even know some of these variations existed!). Then, a three minute Sirsasana I, while he played harmonium and chanted to Radhe and Govinda before settling us into Savasana. Raghunath has such an everyday guy way about him, but then he starts to share his wisdom and you soon realize he is anything but. There was a lot of humor and fun, but a clear purpose and intent to his words. YOGA. Surround yourself with people and experiences that raise you up, avoid those that bring you down. It’s easy to “like” those who are “like” you and who “like” you, learn to “like” those who are not and do not. Look people in the eye. Very rarely do we actually make the effort to look at people. For some, it may even feel uncomfortable to make eye contact. Make the connection. Two men were walking down the street when they heard another man screaming, “help me, help me!”. As they approached the screaming man, they saw that he was holding on to a large tree. He called to them, “help me, help me, I am stuck to this tree!!!”. They looked at each other, then looked back at him and said… “Then, let go”. A beautiful story to clearly illustrate that often we perceive things to be holding us back or keeping us down, when really we are holding on to them, all we need to do is let them go. The difference between forcing vs. working really hard at something is EGO. If ego drives you to want, you are forcing. Don’t force. Just practice. It may take hours, days, or years. It doesn’t matter. Don’t force. I will spend lots of time in my home practice putting all of this knowledge into action and see what happens. I hope to be flying solo (no walls, no assists) soon!